Echo in atrial fibrillation device therapies. To be presented at the 30th annual Scientific Sessions of the American Society of Echocardiography in Portland, OR on June 24, 2019. Echo Jeopardy contestant. To be presented at the 30th annual Scientific Sessions of the American Society of Echocardiography in Portland, OR on June 22, 2019. 4D echo for prosthetic valves. To be presented at XXV World Congress of Cardiology in Lodz, Poland on May 18, 2019. My best 4D echo case. To be presented at XXV World Congress of Cardiology in Lodz, Poland on May 18, 2019. Let's play a game - a fun way to learn about echo artifacts. To be presented at XXV World Congress of Cardiology in Lodz, Poland on May 17, 2019. Cardiac tumors and embolism. To be presented at XXV World Congress of Cardiology in Lodz, Poland on May 17, 2019. Practice board exam on diastolic dysfunction, pericardial disease, and congenital heart disease. To be presented at the 20th Annual Echo Board Course of the American Society of Echocardiography in Boston, MA on May 7, 2019. Contrast echocardiography. To be presented at the 20th Annual Echo Board Course of the American Society of Echocardiography in Boston, MA on May 7, 2019. Practice board exam on stress echocardiography, 3d, hypertrophic cardiomyopathy, and systemic disease. To be presented at the 20th Annual Echo Board Course of the American Society of Echocardiography in Boston, MA on May 6, 2019. Primer of interventional echo. To be presented at the 20th Annual Echo Board Course of the American Society of Echocardiography in Boston, MA on May 6, 2019. Practice board exam questions on endocarditis, hemodynamics and left ventricular remodeling. To be presented at the 20th Annual Echo Board Course of the American Society of Echocardiography in Boston, MA on May 4, 2019. Endocarditis and its complications: The role of echocardiography. To be presented at the 20th Annual Echo Board Course of the American Society of Echocardiography in Boston, MA on May 4, 2019. Mitral valve clip -- why, when, whom? Technical approaches. Presented at Echocardiography Days - Sofia 2019 in Sofia, Bulgaria on April 5 and 6, 2019. Transcatheter mitral valve repair. Presented at Echocardiography Days - Sofia 2019 in Sofia, Bulgaria on April 5 and 6, 2019. Transcatheter mitral valve replacement, valve-in-valve, valve-in-ring. Presented at Echocardiography Days - Sofia 2019 in Sofia, Bulgaria on April 5 and 6, 2019. Interventional echocardiography I: What is new in transcatheter aortic valve replacement. Presented at Echo Imaging New York - State-of-the-Art 2019 Mayo / Columbia course on March 23, 2019 in New York City. Seeing the mitral valve in a truly new 3D light. Presented at 35th Annual International Conference on Recent Advances in Echocardiography and Allied Techniques on March 15, 2019 in New Orleans, LA. Cardiac Abnormalities in Systemic Disease: Amyloid and Sarcoid. Presented at the 32nd Annual State-of-the-Art Echocardiography course of the American Society of Echocardiography on February 18, 2019 in San Diego, CA. Pericardial Fat and Epicardial Fat. Presented at the 32nd Annual State-of-the-Art Echocardiography course of the American Society of Echocardiography on February 18, 2019 in San Diego, CA. LAA appendage closure - pre-procedure. Presented at the 32nd Annual State-of-the-Art Echocardiography course of the American Society of Echocardiography on February 17, 2019 in San Diego, CA. TAVR complications. Presented at the 32nd Annual State-of-the-Art Echocardiography course of the American Society of Echocardiography on February 17, 2019 in San Diego, CA. Multimodality imaging for percutaneous repair of structural heart disease. Presented at Ruijin Hospital, Shanghai, China on November 5, 2018. New role of echocardiography in guiding interventional procedures. Presented at 长三角超声会议西门子心脏超声论坛日 程表 (Long Triangle Ultrasound Conference Siemens Heart Ultrasound Forum Day Schedule) in Yiwu, China on November 3, 2018. Cases: Stress testing in valvular disease. Presented at the 2018 ECHO Florida, a state-of-the-art course organized by the American Society of Echocardiography in Orlando, FL on October 9, 2018. TAVR: Procedure guidance by echo. Presented at the 2018 ECHO Florida, a state-of-the-art course organized by the American Society of Echocardiography in Orlando, FL on October 9, 2018. Goofs, coups, and things i have learned in the past year: Part 2. Presented at the 2018 ECHO Florida, a state-of-the-art course organized by the American Society of Echocardiography in Orlando, FL on October 8, 2018. Echo in asymptomatic mitral regurgitation and aortic regurgitation. Presented at the 2018 ECHO Florida, a state-of-the-art course organized by the American Society of Echocardiography in Orlando, FL on October 8, 2018. Goofs, coups, and things i have learned in the past year: Part 1. Presented at the 2018 ECHO Florida, a state-of-the-art course organized by the American Society of Echocardiography in Orlando, FL on October 7, 2018.
â€œThe cath showed what?â€� Challenging stress echo cases. Presented at the 2018 ECHO Florida, a state-of-the-art course organized by the American Society of Echocardiography in Orlando, FL on October 7, 2018. Guidelines for the use of echocardiography in the evaluation of a cardiac source of embolism. Presented at the 2018 ECHO Florida, a state-of-the-art course organized by the American Society of Echocardiography in Orlando, FL on October 7, 2018. TAVR Debate: The minimalist approach to imaging is safe (and here's the data). Presented at TCT 2018 on September 22, 2018 in San Diego, Ca. Imaging Guidance: Percutaneous ASD & VSD repair. Presented at TCT 2018 on September 22, 2018 in San Diego, Ca. Common congenital heart disease in adults â€“ Overview and cases. Presented at the 35th Jeffrey M. Carlton Heart & Vascular Institute Advanced Echo Conference on September 16, 2018 in Newport Beach, CA. Update on speckle tracking: In what clinical scenarios? - Overview and cases. Presented at the 35th Jeffrey M. Carlton Heart & Vascular Institute Advanced Echo Conference on September 16, 2018 in Newport Beach, CA. How to obtain optimal data in stress echo. Presented at the 35th Jeffrey M. Carlton Heart & Vascular Institute Advanced Echo Conference on September 15, 2018 in Newport Beach, CA. Role of echo in pulmonary embolism â€“ Points and cases. Presented at the 35th Jeffrey M. Carlton Heart & Vascular Institute Advanced Echo Conference on September 15, 2018 in Newport Beach, CA. Role of 2D/3D Echo in guiding percutaneous catheter interventions for mitral regurgitation (Mitral clip, TMV repair, TMV replacement). Presented at the 35th Jeffrey M. Carlton Heart & Vascular Institute Advanced Echo Conference on September 14, 2018 in Newport Beach, CA. Degenerated bioprosthetic mitral valve and paravalvular leak - Percutaneous options or redo Surgery? Presented at the 29th Annual Scientific Sessions of the American Society of Echocardiography in Nashville, TN on June 25, 2018. The role of echo in left atrial appendage closure: Current imaging. Presented at the 29th Annual Scientific Sessions of the American Society of Echocardiography in Nashville, TN on June 23, 2018. Adopting guidelines into clinical practice: Cardiac source of embolism. Presented at the 29th Annual Scientific Sessions of the American Society of Echocardiography in Nashville, TN on June 23, 2018. 2D/3D TEE in guiding ASD closure. 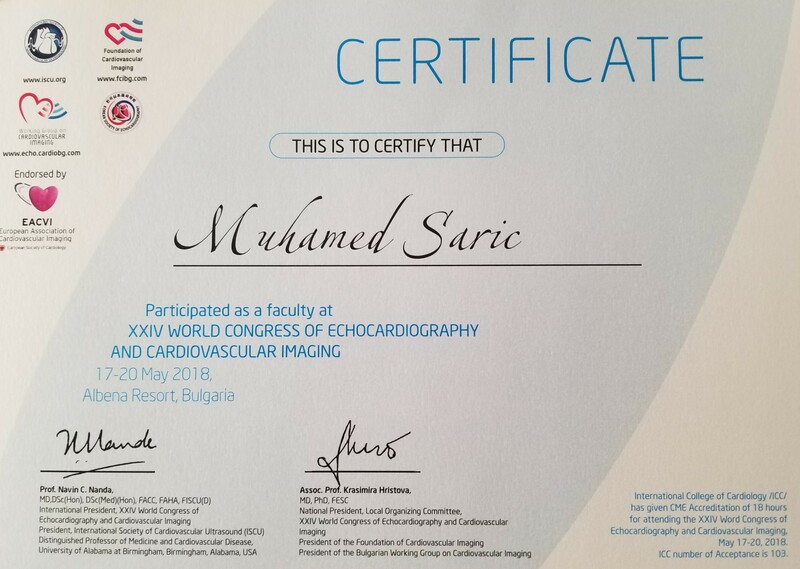 Presented at the 24th World Congress of Echocardiography in Albena, Bulgaria on May 20, 2018. Mitral clip: Basic echocardiographic imaging. Presented at the 24th World Congress of Echocardiography in Albena, Bulgaria on May 19, 2018. Imaging guidance of transcatheter aortic valve replacement (TAVR). 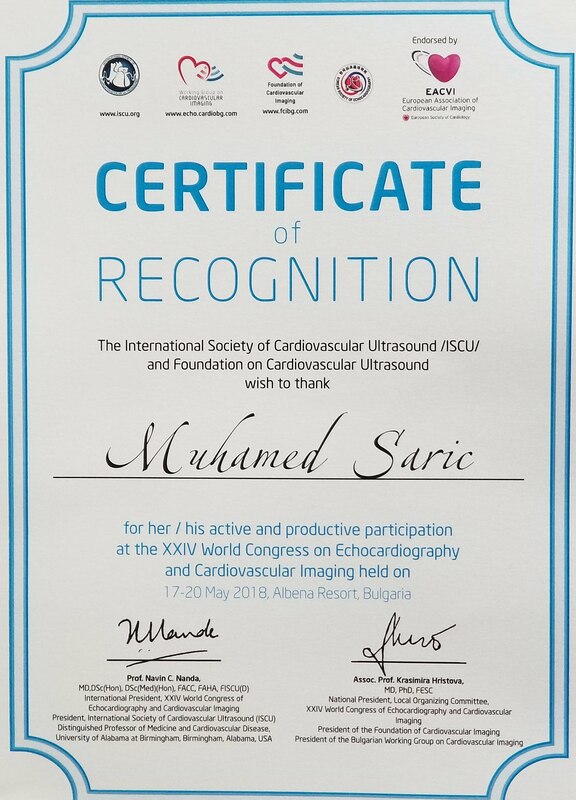 Presented at the 24th World Congress of Echocardiography in Albena, Bulgaria on May 18, 2018. Moderator Band - What Does It Moderate? Presented at the 24th World Congress of Echocardiography in Albena, Bulgaria on May 17, 2018. Patent foramen ovale: Shunt quantification & closure guidance. Presented at the 24th World Congress of Echocardiography in Albena, Bulgaria on May 17, 2018. 3D echo for valvular interventions. Presented at the 24th World Congress of Echocardiography in Albena, Bulgaria on May 17, 2018. Interventional echocardiography. Presented at the 20th Annual State-of-the-Art Echo 2018 in New York City on April 20, 2018. Course director: Rebecca Hahn. Hypertrophic cardiomyopathy. Presented at the 20th Annual State-of-the-Art Echo 2018 in New York City on April 19, 2018. Course director: Rebecca Hahn. Stress echo cases - Are you as good as the experts? Presented at the 20th Annual State-of-the-Art Echo 2018 in New York City on April 18, 2018. Course director: Rebecca Hahn. ASE Guidelines: Assessment of ASD and PFO and Evaluation of a Cardiac Source of Embolism. Presented at the 20th Annual State-of-the-Art Echo 2018 in New York City on April 18, 2018. Course director: Rebecca Hahn. ASE Guidelines: Multimodality imaging of diseases of the thoracic aorta in adults. Presented at the 20th Annual State-of-the-Art Echo 2018 in New York City on April 18, 2018. Course director: Rebecca Hahn. Pathophysiology and natural history of degenerative tricuspid regurgitation. Presented at the 4th Scientific Meeting of the Heart Valve Society in New York City on April 13, 2018. The elderly patient with aortic stenosis: Assessing surgical risk and frailty. Presented at the 67th Annual Scientific Sessions of the American College of Cardiology (ACC) in Orlando, FL on March 11, 2018. Advancing the TAVR frontier: Will it seal, will it fly? Presented at the 34th Annual International Conference on Recent Advances in Echocardiography And Allied Techniques (MRI, CT Scan, Nuclear) in Orlando, FL on March 9, 2018. Diseases of aorta - Marfan, dissection, aortic atheroma. Presented at the 31st Annual State of the Art Echocardiography course in San Diego, CA on Tuesday, February 20, 2018. Myocardial disease, cardiomyopathy: Question and answer. Presented at the 31st Annual State of the Art Echocardiography course in San Diego, CA on Monday, February 19, 2018. Common adult congenital heart disease: Atrial septal defect, ventricular septal defect, Ebsteinâ€™s anomaly. Presented at the 31st Annual State of the Art Echocardiography course in San Diego, CA on Monday, February 19, 2018. Case studies in systemic illness and the heart: Sarcoid, hemochromatosis, hypereosinophilia. Presented at the 31st Annual State of the Art Echocardiography course in San Diego, CA on Monday, February 19, 2018. Left atrial appendage closure, PFO closure: Question and answer. Presented at the 31st Annual State of the Art Echocardiography course in San Diego, CA on Monday, February 19, 2018. Left atrial appendage closure, PFO closure: Oops, what went wrong here? Thrombus on or leak around the device? Presented at the 31st Annual State of the Art Echocardiography course in San Diego, CA on Monday, February 19, 2018. Pre procedure TAVR workshop: Complications from other labs! Presented at the 31st Annual State of the Art Echocardiography course in San Diego, CA on Saturday, February 17, 2018. Pre procedure TAVR workshop: Intraprocedural TTE. Presented at the 31st Annual State of the Art Echocardiography course in San Diego, CA on Saturday, February 17, 2018. Cases: Stress testing in valvular disease. Presented at the American Society of Echocardiography 6th Annual Echo Florida, Orlando, FL on October 10, 2017. Left atrial appendage closure devices. Presented at the American Society of Echocardiography 6th Annual Echo Florida, Orlando, FL on October 10, 2017. TAVR: Procedure guidance by echo. Presented at the American Society of Echocardiography 6th Annual Echo Florida, Orlando, FL on October 10, 2017. Valvular heart disease: Goofs, coups, and things I learned this past year: Part III. Presented at the American Society of Echocardiography 6th Annual Echo Florida, Orlando, FL on October 9, 2017. Coronary artery disease: Echo in asymptomatic mitral regurgitation and aortic regurgitation. Presented at the American Society of Echocardiography 6th Annual Echo Florida, Orlando, FL on October 9, 2017. General echocardiography: Goofs, Coups, and Things I Have Learned in the Past Year: Part II. Presented at the American Society of Echocardiography 6th Annual Echo Florida, Orlando, FL on October 8, 2017. Stress echo cases - Are you as good as the experts? Presented at the American Society of Echocardiography 6th Annual Echo Florida, Orlando, FL on October 8, 2017. Guidelines for the use of echocardiography in the evaluation of a cardiac source of embolism. Presented at the American Society of Echocardiography 6th Annual Echo Florida, Orlando, FL on October 8, 2017. Diastology: Simplified new guidelines. Presented at the 17th Annual Mount Sinai Echo New York course on October 7, 2017 in New York City. Course directors: Farooq Chaudhry and Jagat Narula. Common echo artifacts: Mechanisms and how to identify them with case studies. Presented at the 17th Annual Mount Sinai Echo New York course on October 7, 2017 in New York City. Course directors: Farooq Chaudhry and Jagat Narula. Basic principles of Doppler physics. Presented at the 17th Annual Mount Sinai Echo New York course on October 7, 2017 in New York City. Course directors: Farooq Chaudhry and Jagat Narula. Basic principles of ultrasound physics. Presented at the 17th Annual Mount Sinai Echo New York course on October 7, 2017 in New York City. Course directors: Farooq Chaudhry and Jagat Narula. Which patients with stroke should undergo TEE? Presented at the 28th Annual Scientific Sessions of the American Society of Echocardiography in Baltimore, MD on June 6, 2017. Guidelines in action: 3 cases, 3 key points | Cardiac source of embolism. Presented at the 28th Annual Scientific Sessions of the American Society of Echocardiography in Baltimore, MD on June 6, 2017. Left atrial appendage closure: procedural guidance with TEE. Presented at the 28th Annual Scientific Sessions of the American Society of Echocardiography in Baltimore, MD on June 5, 2017. Sludge, stunning and anticoagulation strategies. Presented at the 28th Annual Scientific Sessions of the American Society of Echocardiography in Baltimore, MD on June 3, 2017. The role of TEE in the selection, guidance, and follow-up of LAA closure. Presented at the 2017 Heart Rhythm Society annual meeting during a joint session Imaging and EP Physicians: Sisters & Brothers Joined at the Hips organized by the Heart Rhythm Society and American Society of Echocardiography in Chicago, IL on May 11, 2017. Percutaneous mitral valve intervention update. Presented at the 3rd Annual Invasive Cardiology Update for Practicing Physicians at New York University Medical School on April 14, 2017. Evaluation and treatment of valvular heart disease. Presented at American College of Physicians (ACP) Internal Medicine Meeting on March 31, 2017 in San Diego, CA. Imaging in mitral valvular intervention: E-clip and beyond. Presented at the 66th Annual Scientific Session of the American College of Cardiology (ACC) in Washington, DC on March 18, 2017. Severe acute aortic regurgitation. Presented at the 66th Annual Scientific Session of the American College of Cardiology (ACC) in Washington, DC on March 17, 2017. What did EKOS do to echos? Presented at the 33rd Annual International Conference on Recent Advances in Echocardiography And Allied Techniques (MRI, CT Scan, Nuclear) in Washington, DC on March 16, 2017. Left ventricular assist device: What should I report? Presented at the American Society of Echocardiography 30th Annual State of the Art Course: Echo Southwest in Tucson, AZ on February 21, 2017. Echocardiography: A PA catheter in a box. Presented at the American Society of Echocardiography 30th Annual State of the Art Course: Echo Southwest in Tucson, AZ on February 20, 2017. I hear contrast is not safe: Is that true? Presented at the American Society of Echocardiography 30th Annual State of the Art Course: Echo Southwest in Tucson, AZ on February 20, 2017. Echo jeopardy. Presented at the American Society of Echocardiography 30th Annual State of the Art Course: Echo Southwest in Tucson, AZ on February 19, 2017. TAVR workshop: Echo measurements pre, post and intra procedure. Presented at the American Society of Echocardiography 30th Annual State of the Art Course: Echo Southwest in Tucson, AZ on February 19, 2017. Echo before the clip: What should the echo report include? Presented at the American Society of Echocardiography 30th Annual State of the Art Course: Echo Southwest in Tucson, AZ on February 18, 2017. Read with the experts: Review interesting and complex cases from across the country. Presented at the American Society of Echocardiography 30th Annual State of the Art Course: Echo Southwest in Tucson, AZ on February 18, 2017. Echocardiographic evaluation of the tricuspid valve. Presented at the American Society of Echocardiography 30th Annual State of the Art Course: Echo Southwest in Tucson, AZ on February 18, 2017. Role of echocardiography in TAVR. Presented at TCT2016 in Washington, DC on November 1, 2016. Cardiac masses. Presented at the American Society of Echocardiography 5th Annual Echo Florida, Orlando, FL on October 11, 2016. Echo/clinical conundrums I: What's in the heart? Presented at the American Society of Echocardiography 5th Annual Echo Florida, Orlando, FL on October 10, 2016. Stress echo cases - Are you as good as the experts. Presented at the American Society of Echocardiography 5th Annual Echo Florida, Orlando, FL on October 9, 2016. Guidelines for the echocardiographic assessment of atrial septal defect and patent foramen ovale. Presented at the American Society of Echocardiography 5th Annual Echo Florida, Orlando, FL on October 9, 2016. Guidelines for the use of echocardiography in the evaluation of a cardiac source of embolism. Presented at the American Society of Echocardiography 5th Annual Echo Florida, Orlando, FL on October 9, 2016. Cases: Strain & contrast. Presented at the American Society of Echocardiography 5th Annual Echo Florida, Orlando, FL on October 9, 2016. Common echo artifacts: Mechanisms and diagnosis. Presented at the 16th Annual Mount Sinai Echo New York course on October 8, 2016 in New York City. Course directors: Farooq Chaudhry and Jagat Narula. Basics of Doppler physics. Presented at the 16th Annual Mount Sinai Echo New York course on October 8, 2016 in New York City. Course directors: Farooq Chaudhry and Jagat Narula. Basics of ultrasound physics. Presented at the 16th Annual Mount Sinai Echo New York course on October 8, 2016 in New York City. Course directors: Farooq Chaudhry and Jagat Narula. Heart failure cases. Presented at the 38th Annual Echo Northwestern Program at Northwestern Memorial Hospital in Chicago, IL on September 19, 2016. What is strain and how do I use it? Presented at the 38th Annual Echo Northwestern Program at Northwestern Memorial Hospital in Chicago, IL on September 19, 2016. Identifying the source of embolism: What can we learn from the new ASE Guidelines? Presented at the 38th Annual Echo Northwestern Program at Northwestern Memorial Hospital in Chicago, IL on September 18, 2016. Anatomy and function of the right ventricle using echo with illustrative cases. Presented at the 38th Annual Echo Northwestern Program at Northwestern Memorial Hospital in Chicago, IL on September 18, 2016. Echo post TAVR procedure. Presented at the TAVR: A Multi-disciplinary, Multi-Modality Heart Team Approach conference in New York, NY on September 9, 2016. Echo during TAVR procedure. Presented at the TAVR: A Multi-disciplinary, Multi-Modality Heart Team Approach conference in New York, NY on September 9, 2016. Quick blast: Prosthetic valves. Presented at the 2016 NYU Langone Comprehensive Cardiology Seminar and Board Review Course on September 9, 2016 in New York City. Mitral valve disease. Presented at the 2016 NYU Langone Comprehensive Cardiology Seminar and Board Review Course on September 9, 2016 in New York City. Aortic valve disease. Presented at the 2016 NYU Langone Comprehensive Cardiology Seminar and Board Review Course on September 9, 2016 in New York City. Imaging for TAVR: Use of echo. Presented at the 2016 China Heart Congress (CHC) on August 11, 2016 in Beijing, China. Live Case 1: TAVR with New Device. Live case participant and discussant at the 2016 China Heart Congress (CHC) on August 12, 2016 in Beijing, China. Standard imaging of echocardiography in TAVR: Pre, during, and post procedure. Presented at the 2016 China Heart Congress (CHC) on August 13, 2016 in Beijing, China. Getting through the mandateâ€¦ The Guideline Update | Cardiac source of embolism. Presented at the 27th Annual Scientific Session of the American Society of Echocardiography in Seattle, WA on June 14, 2016. Is it truly severe AS? When transthoracic echocardiography just isn't enough. Presented at the 27th Annual Scientific Session of the American Society of Echocardiography in Seattle, WA on June 11, 2016. 3D echocardiography for guidance of percutaneous structural heart disease repairs. Presented at the plenary session of the Scientific Sessions of the Cardiology Association of Bosnia-Herzegovina in Mostar, Bosnia-Herzegovina on May 26, 2016. Imaging for guidance of left atrial appendage closure devices - Cases: the good, bad and the ugly. Presented at the 37th Annual Scientific Sessions of the Heart Rhythm Society in San Francisco on May 4, 2016 during a session that I co-chaired with Dr. Robert Siegel from Los Angeles, CA. The Watchman device: Intraprocedural imaging pearls. Presented at the 65th Annual Scientific Sessions of the American College of Cardiology (ACC) in Chicago, IL on April 4, 2016 during a session that I co-chaired with Brian K. Whisenant from Salt Lake City, UT. Severe primary mitral regurgitation: Complex lesions. Presented at the 65th Annual Scientific Sessions of the American College of Cardiology (ACC) in Chicago, IL on April 2, 2016. Severe tricuspid regurgitation late following mitral valve surgery: Timing of intervention. Presented at the 65th Annual Scientific Sessions of the American College of Cardiology (ACC) in Chicago, IL on April 2, 2016. It's not a tumor -- but it's a Krukenberg. Presented at the 32nd Annual International Conference on Recent Advances in Echocardiography and Allied Techniques in Chicago, IL on April 1, 2016 during a session that I will co-chair with Drs. Nilda Espinola-Zavaleta, Lee J. Frazin, John Gorcsan III and Serdar KÃ¼Ã§Ã¼koğlu. Intraprocedural TAVR imaging: Time & place for echo. Presented at the 18th Annual State of the Art Echo | CRF Conference in New York City on March 22, 2016. MitraClip: How do I know it's on label degenerative mitral regurgitation? Presented at the Heart Valve Society Scientific Meeting in New York City on March 19, 2016. Echocardiographic evaluation of a mitral valve prosthesis. Presented at 29th Annual State of the Art Echocardiography course organized by the American Society of Echocardiography in Tucson, AZ on February 14, 2016. Cases: TAVR complications - What should I be looking for? Presented at 29th Annual State of the Art Echocardiography course organized by the American Society of Echocardiography in Tucson, AZ on February 14, 2016. How do I evaluate a patient being considered for TAVR? Presented at 29th Annual State of the Art Echocardiography course organized by the American Society of Echocardiography in Tucson, AZ on February 14, 2016. Carcinoid. Presented at 29th Annual State of the Art Echocardiography course organized by the American Society of Echocardiography in Tucson, AZ on February 14, 2016. Focus on congenital heart disease: Part 2. Presented at 29th Annual State of the Art Echocardiography course organized by the American Society of Echocardiography in Tucson, AZ on February 13, 2016. Focus on congenital heart disease: Part 1. Presented at 29th Annual State of the Art Echocardiography course organized by the American Society of Echocardiography in Tucson, AZ on February 13, 2016. Common echo artifacts: Mechanisms and diagnosis. Presented at the 15th Annual Mount Sinai Echo New York course on October 10, 2015 in New York City. Course directors: Farooq Chaudhry and Jagat Narula. A primer: Doppler physics. Presented at the 15th Annual Mount Sinai Echo New York course on October 10, 2015 in New York City. Course directors: Farooq Chaudhry and Jagat Narula. A primer: Ultrasound physics. Presented at the 15th Annual Mount Sinai Echo New York course on October 10, 2015 in New York City. Course directors: Farooq Chaudhry and Jagat Narula. Read with the experts. Presented at the Sights & Sounds of Echocardiography in in the Heart of the Big Apple course in New York City on September 12, 2015. Common congenital malformations encountered by adult cardiologists: See, recognize and diagnose. Presented at the Sights & Sounds of Echocardiography in in the Heart of the Big Apple course in New York City on September 12, 2015. Nontraditional causes of heart failure: Sarcoid, amyloid, and hemochromatosis. Presented at the Sights & Sounds of Echocardiography in in the Heart of the Big Apple course in New York City on September 12, 2015. Vegetation of a prosthetic valve. Presented at the Sights & Sounds of Echocardiography in in the Heart of the Big Apple course in New York City on September 11, 2015. Evaluation of a patient with prosthetic valve using cases. Presented at the Sights & Sounds of Echocardiography in in the Heart of the Big Apple course in New York City on September 11, 2015. Prosthetic heart valves. Presented at the 2015 NYU Comprehensive Cardiology Seminar and Board Review Course in New York City on September 11, 2015. Valvular hemodynamics: Review of echocardiographic evaluation. Presented at the 2015 NYU Comprehensive Cardiology Seminar and Board Review Course in New York City on September 11, 2015. Diastolic function 101. Presented at the Sights & Sounds of Echocardiography in in the Heart of the Big Apple course in New York City on September 10, 2015. Calculating aortic valve hemodynamics. Presented at the Sights & Sounds of Echocardiography in in the Heart of the Big Apple course in New York City on September 10, 2015. Diastolic dysfunction: Diagnosis & management. Presented at the 2015 NYU Comprehensive Cardiology Seminar and Board Review Course in New York City on September 9, 2015. Pericardial disease. Presented at the 2015 NYU Comprehensive Cardiology Seminar and Board Review Course in New York City on September 9, 2015. Familial dilated cardiomyopathy. Presented at the 26th Annual Scientific Session of the American Society of Echocardiography in Boston on June 16, 2015. Symposia: Three of a Kind Game. 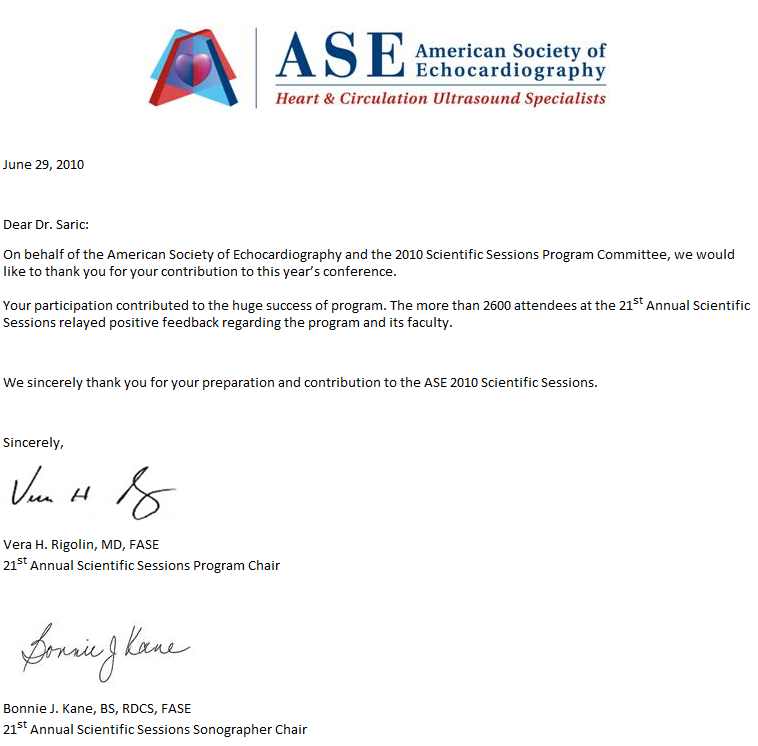 Contributed 5 questions for the game which will take place at the 26th Annual Scientific Session of the American Society of Echocardiography in Boston on June 15, 2015. Challenging cases in aortic regurgitation: Paravalvular regurgitation. Presented at the 26th Annual Scientific Session of the American Society of Echocardiography in Boston on June 15, 2015. Left atrial appendage exclusion devices. Presented at the 26th Annual Scientific Session of the American Society of Echocardiography in Boston on June 14, 2015. Maintenance of Certification Part II. Proctored this session at the 26th Annual Scientific Session of the American Society of Echocardiography in Boston on June 12, 2015. Assessment of mitral regurgitation post clipping. Presentation prepared for TVT - Transcatheter Valve Therapies conference in Chicago, and presented by coauthor Mathew Williams on June 6, 2015. Selection of patients for mitral valve clip. Presented at the 20th Asian Pacific Society of Cardiology Congress in Abu Dhabi, United Arab Emirates on May 2, 2015. Patient-prosthesis mismatch in mitral valve replacement. Presented at the 20th Asian Pacific Society of Cardiology Congress in Abu Dhabi, United Arab Emirates on May 1, 2015. What is the preferred and gold standard method for myocardial viability? Presented at the 20th Asian Pacific Society of Cardiology Congress in Abu Dhabi, United Arab Emirates on April 30, 2015. Selected applications for echocardiography for assessment of left ventricular and right ventricular function. Poster session moderator (with JosÃ© Banchs, MD Anderson Cancer Center) at the 65th Annual Scientific Session of the American College of Cardiology in San Diego, CA on March 16, 2015. Trends and treatment for aortic stenosis. Poster session moderator (with Jeffrey J. Popma, Harvard University) at the 65th Annual Scientific Session of the American College of Cardiology in San Diego, CA on March 15, 2015. A mitral valve with a cleft leaves a patient bereft. Presented at the 31st International Conference on Recent Advances in Echocardiography and Allied Techniques (MRI, CT Scan, Nuclear) in San Diego, CA on Friday, March 13, 2015 during a session that I will co-chair with Drs. Aiden Abidov and Jeane Tsutsui. Watchman device for atrial fibrillation. Presented at the 28th Annual State of the Art Echocardiography course organized by the American Society of Echocardiography in Scottsdale, AZ on February 24, 2015. Primary and metastatic cancers of the heart. Presented at the 28th Annual State of the Art Echocardiography course organized by the American Society of Echocardiography in Scottsdale, AZ on February 23, 2015. Primary pulmonary hypertension. Presented at the 28th Annual State of the Art Echocardiography course organized by the American Society of Echocardiography in Scottsdale, AZ on February 23, 2015. Hemochromatosis. Presented at the 28th Annual State of the Art Echocardiography course organized by the American Society of Echocardiography in Scottsdale, AZ on February 23, 2015. Echo before, during and after TAVR: What are the critical elements? Presented at the 28th Annual State of the Art Echocardiography course organized by the American Society of Echocardiography in Scottsdale, AZ on February 22, 2015. Should this patient be treated with surgery, clip or watchful waiting? Presented at the 28th Annual State of the Art Echocardiography course organized by the American Society of Echocardiography in Scottsdale, AZ on February 22, 2015. Atrioventricular canal. Presented at the 28th Annual State of the Art Echocardiography course organized by the American Society of Echocardiography in Scottsdale, AZ on February 21, 2015. Gerbode defect. Presented at the 28th Annual State of the Art Echocardiography course organized by the American Society of Echocardiography in Scottsdale, AZ on February 21, 2015. Percutaneous and surgical treatment of congenital heart disease. Presented at the 28th Annual State of the Art Echocardiography course organized by the American Society of Echocardiography in Scottsdale, AZ on February 21, 2015. Transposition of great arteries. Presented at the 28th Annual State of the Art Echocardiography course organized by the American Society of Echocardiography in Scottsdale, AZ on February 21, 2015. Congenital left heart obstructive lesions II: Subvalvular and supravalvular aortic stenosis; Coarctation. Presented at the 28th Annual State of the Art Echocardiography course organized by the American Society of Echocardiography in Scottsdale, AZ on February 21, 2015. Evaluation of VSD, PDA and anomalous veins. Presented at the 28th Annual State of the Art Echocardiography course organized by the American Society of Echocardiography in Scottsdale, AZ on February 21, 2015. Evaluation of atrial septal defects. Presented at the 28th Annual State of the Art Echocardiography course organized by the American Society of Echocardiography in Scottsdale, AZ on February 21, 2015. Low-flow severe aortic stenosis. Presented at the 2014 American Heart Association (AHA) Scientific Sessions in Chicago on Sunday, November 16, 2014, during the session entitled Imaging and Clinical Decision Making in Complex Valve Disease. Mechanisms of common echo artifacts. Presented at the 14th Annual Mount Sinai Echo New York course on October 13, 2014 in New York City. Course directors: Farooq Chaudhry and Jagat Narula. Basic principles of ultrasound and Doppler physics. Presented at the 14th Annual Mount Sinai Echo New York course on October 13, 2014 in New York City. Course directors: Farooq Chaudhry and Jagat Narula. Echo evaluation of congenital heart disease in adults. Presented at the 27th Annual Conference on Echocardiography in Callaway Gardens, GA on October 11, 2014. Use of 3D TEE to guide percutaneous interventions. Presented at the 27th Annual Conference on Echocardiography in Callaway Gardens, GA on October 11, 2014. You have not seen these spectacular and instructive cases before. Presented at the 27th Annual Conference on Echocardiography in Callaway Gardens, GA on October 10, 2014. Echo artifacts: How to differentiate from real findings. Presented at the 27th Annual Conference on Echocardiography in Callaway Gardens, GA on October 10, 2014. Famous case studies. Presented at the 27th Annual Conference on Echocardiography in Callaway Gardens, GA on October 9, 2014. How to perform a systematic 2D and 3D transesophageal echocardiographic exam. Presented at the 27th Annual Conference on Echocardiography in Callaway Gardens, GA on October 9, 2014. Not your ordinary ischemic heart disease: Anomalous coronary connections. Presented at the 25th scientific sessions of the American Society of Echocardiography in Portland, OR, on June 24, 2014. Aortic insufficiency: Pitfalls of measurements. presented (in lieu of Itzhak Kronzon) at the 25th scientific sessions of the American Society of Echocardiography in Portland, OR, on June 23, 2014. The school of hard knocks - Learning from my greatest mistakes: Quandaries in discriminating cardiomyopathies. Presented at the 25th scientific sessions of the American Society of Echocardiography in Portland, OR, on June 21, 2014. Non-secundum atrial septal defects (primum ASD; sinus venosus ASD with partial anomalous pulmonary venous return. Presented at Sights and Sounds of Echocardiography in the Heart of the Big Apple in New York City on May 23, 2014. Congenital ventricular septal defects. Presented at Sights and Sounds of Echocardiography in the Heart of the Big Apple in New York City on May 23, 2014. Spectrum of right heart disease: RV dysplasia, Ebstein's anomaly, RV infarct. Presented at Sights and Sounds of Echocardiography in the Heart of the Big Apple in New York City on May 23, 2014. Cardiac resynchronization therapy: Responder Profile. Presented at Sights and Sounds of Echocardiography in the Heart of the Big Apple in New York City on May 23, 2014. Adult congenital disease: Case based learning. Presented at Sights and Sounds of Echocardiography in the Heart of the Big Apple in New York City on May 22, 2014. Left ventricular systolic function. Presented at Sights and Sounds of Echocardiography in the Heart of the Big Apple in New York City on May 22, 2014. Is there any additive benefits of 3D echo in valvular heart disease assessment? Presented on April 23, 2014 at the 2014 State of the Art Echocardiography Conference, Riyadh, Saudi Arabia. Role of echocardiography in AF procedures. Presented on April 23, 2014 at the State of the Art 2014 Echocardiography Conference, Riyadh, Saudi Arabia. Use of echocardiography in interventional procedures. Presented on April 23, 2014 at the State of the Art 2014 Echocardiography Conference, Riyadh, Saudi Arabia. TEE in adults with congenital heart disease. Presented on April 22, 2014 at the State of the Art 2014 Echocardiography Conference, Riyadh, Saudi Arabia. The current appropriate use of echocardiography, and where does echo fits in practice guidelines. Presented on April 22, 2014 at the State of the Art 2014 Echocardiography Conference, Riyadh, Saudi Arabia. A septal defect that does not 'bode' well. Presented at the 30th International Conference on Recent Advances in Echocardiography and Allied Techniques (MRI, CT Scan, Nuclear) in Washington, DC, on March 28, 2014 at a session that I co-chaired with Drs. Brian D. Hoit and Hanumanth K. Reddy. Post MI complications: Is it LV aneurysm or pseudoaneurysm? Presented at the ASE-sponsored 27th Annual State of the Art Echocardiography conference, Scottsdale, AZ on February 18, 2014. Myocardial restriction: What is it and how does it differ from constriction? Presented at the ASE-sponsored 27th Annual State of the Art Echocardiography conference, Scottsdale, AZ on February 17, 2014. Right ventricular dysfunction due to left ventricular failure. Presented at the ASE-sponsored 27th Annual State of the Art Echocardiography conference, Scottsdale, AZ on February 17, 2014. Indeterminate LV filling pressures. Presented at the ASE-sponsored 27th Annual State of the Art Echocardiography conference, Scottsdale, AZ on February 17, 2014. Resynchronization therapy â€“ Can echo identify the optimal candidate? - Nonresponders. Presented at the ASE-sponsored 27th Annual State of the Art Echocardiography conference, Scottsdale, AZ on February 17, 2014. Right ventricular infarct. Presented at the ASE-sponsored 27th Annual State of the Art Echocardiography conference, Scottsdale, AZ on February 17, 2014. Stress (takotsubo) cardiomyopathy. Presented at the ASE-sponsored 27th Annual State of the Art Echocardiography conference, Scottsdale, AZ on February 16, 2014. Quantification of aortic regurgitation â€“ How do I do it? Presented at the ASE-sponsored 27th Annual State of the Art Echocardiography conference, Scottsdale, AZ on February 16, 2014. Echo before, during and after TAVI â€“ What are the critical elements? Presented at the ASE-sponsored 27th Annual State of the Art Echocardiography conference, Scottsdale, AZ on February 16, 2014. Functional & ischemic mitral regurgitation: Valve should be repaired. Presented at the ASE-sponsored 27th Annual State of the Art Echocardiography conference, Scottsdale, AZ on February 16, 2014. Bileaflet mitral valve prolapse. Presented at the ASE-sponsored 27th Annual State of the Art Echocardiography conference, Scottsdale, AZ on February 16, 2014. Maintenance of certification by case-based echocardiography. Presented at the ASE-sponsored 27th Annual State of the Art Echocardiography conference, Scottsdale, AZ on February 15, 2014. 3D echocardiographic imaging of mitral prosthetic valves and repairs: Historical context and detailed description. Presented at the 18th World Congress of Echocardiography in Fujairah, United Arab Emirates on November 22, 2013. 3D prosthetic valve evaluation. Presented at the 18th World Congress of Echocardiography in Fujairah, United Arab Emirates on November 22, 2013. 3D mitral valve evaluation. Presented at the 18th World Congress of Echocardiography in Fujairah, United Arab Emirates on November 21, 2013. Scimitar syndrome (or should it be called 'shamshir syndrome'?). Presented at the 23rd Annual International Conference on Echocardiography and Allied Techniques: Case Studies and Recent Advances in Echocardiography in Dallas, TX on Saturday, November 16, 2013. A cardiac fascinoma: Tumor, thrombus, or vegetation? Presented at the 23rd Annual International Conference on Echocardiography and Allied Techniques: Case Studies and Recent Advances in Echocardiography in Dallas, TX on Saturday, November 16, 2013. My most fascinating cases. Presented at Echo NY â€“ Multimodality Imaging NY 2013 course; New York, NY on October 13, 2013. Course director: Dr. Farooq Chaudhry. Echocardiography in acute coronary syndrome. Presented at Echo NY â€“ Multimodality Imaging NY 2013 course; New York, NY on October 13, 2011. Course director: Dr. Farooq Chaudhry. Principles of ultrasound and Doppler. Presented at Echo NY â€“ Multimodality Imaging NY 2013 course; New York, NY on October 13, 2011. Course director: Dr. Farooq Chaudhry. [Course Postponed] Prosthetic heart valves. Scheduled for presentation at the NYU Cardiovascular Board Review Course in New York, NY on August 24, 2013. [Course Postponed] Valvular hemodynamics: Review of echocardiographic evaluation. Scheduled for presentation at the NYU Cardiovascular Board Review Course in New York, NY on August 24, 2013. [Course Postponed] Diastolic dysfunction: Diagnosis and management. 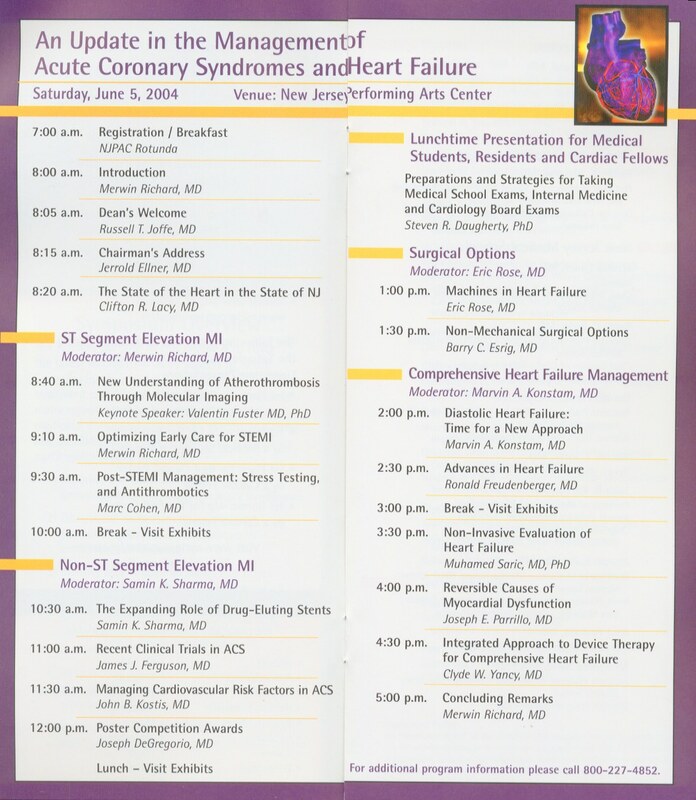 TScheduled for presentation at the NYU Cardiovascular Board Review Course in New York, NY on August 22, 2013. [Course Postponed] Pericardial disease. Scheduled for presentation at the NYU Cardiovascular Board Review Course in New York, NY on August 22, 2013. Scientific sessions wrap-up - Cardiac function. Presented at the 24th scientific sessions of the American Society of Echocardiography in Minneapolis, MN, on July 2 2013. Left atrial appendage closure devices: How can echo help? Presented at the 24th scientific sessions of the American Society of Echocardiography in Minneapolis, MN on June 30, 2013 during a session that I will co-chair with Dr. Steven Goldstein. Imaging essentials: Image features & artifact. Presented at the 24th scientific sessions of the American Society of Echocardiography in Minneapolis, MN on June 29, 2013. Mitral valve hemodynamics. Presented at the American Society of Echocardiography-sponsored course Sights and Sounds of Echocardiography in the Heart of the Big Apple in New York City on May 26, 2013. Stress echocardiography: Theory, practice. Presented at the American Society of Echocardiography-sponsored course Sights and Sounds of Echocardiography in the Heart of the Big Apple in New York City on May 26, 2013. Challenging cases in heart failure. Presented at the American Society of Echocardiography-sponsored course Sights and Sounds of Echocardiography in the Heart of the Big Apple in New York City on May 25, 2013. Common cardiac masses: Cases, pathognomonic features. Presented at the American Society of Echocardiography-sponsored course Sights and Sounds of Echocardiography in the Heart of the Big Apple in New York City on May 25, 2013. Ebstein's anomaly. Presented at the American Society of Echocardiography-sponsored course Sights and Sounds of Echocardiography in the Heart of the Big Apple in New York City on May 25, 2013. Common pitfalls in calculation of aortic valve area. Presented at the American Society of Echocardiography-sponsored course Sights and Sounds of Echocardiography in the Heart of the Big Apple in New York City on May 24, 2013. Right heart for the boards. Presented at the American Society of Echocardiography-sponsored course Sights and Sounds of Echocardiography in the Heart of the Big Apple in New York City on May 23, 2013. Left ventricular systolic function: What is expected you know for the boards. Presented at the American Society of Echocardiography-sponsored course Sights and Sounds of Echocardiography in the Heart of the Big Apple in New York City on May 23, 2013. Quantitative 3D Echocardiography of Heart Valve Disease: Valvular Stenosis. Presented at the 62nd Annual Scientific Sessions of the American College of Cardiology (ACC) in San Francisco on March 11, 2013 during a session co-chaired by Drs. Luigi Badano and Mani A. Vannan. New Horizons in Prosthetic Valve Imaging: What Do They Look Like on 3D Echo? Presented at the 62nd Annual Scientific Sessions of the American College of Cardiology (ACC) in San Francisco on March 9, 2013 during a session co-chaired by Drs. Robert Bonow and Rick Nishimura. Membranous ventricular septal aneurysm: When the windsock blows the wrong way. Presented at the 29th International Conference on Recent Advances in Echocardiography and Allied Techniques (MRI, CT Scan, Nuclear) in San Francisco, CA on March 8, 2013 during a session that I will co-chair with Drs. Anthon R. Fuisz. I am sparkling and I have elevated filling pressure. Presented at the ASE-sponsored 26th Annual State of the Art Echocardiography conference, in Scottsdale, AZ on February 13, 2013. Pulmonary hypertension. Presented at the ASE-sponsored 26th Annual State of the Art Echocardiography conference, in Scottsdale, AZ on February 13, 2013. Heart failure with preserved systolic function: Epidemiology, pathophysiology and diagnosis. Presented at the ASE-sponsored 26th Annual State of the Art Echocardiography conference, in Scottsdale, AZ on February 13, 2013. Case studies in heart failure, LVAD. Presented at the ASE-sponsored 26th Annual State of the Art Echocardiography conference, in Scottsdale, AZ on February 12, 2013. ASD, PFO closure. Presented at the ASE-sponsored 26th Annual State of the Art Echocardiography conference, in Scottsdale, AZ on February 12, 2013. Amyloid heart. Presented at the ASE-sponsored 26th Annual State of the Art Echocardiography conference, in Scottsdale, AZ on February 12, 2013. Involvement of aorto-mitral intervalvular fibrosa in endocarditis. Presented at the ASE-sponsored 26th Annual State of the Art Echocardiography conference, in Scottsdale, AZ on February 11, 2013. Mitral stenosis: Pitfalls in calculation of severity. Presented at the ASE-sponsored 26th Annual State of the Art Echocardiography conference, in Scottsdale, AZ on February 11, 2013. 2D, 3D evaluation of mitral regurgitation. How to quantitate? What pathologies cause MR? Pitfalls of ERO. Is vena contracta adequate? Presented at the ASE-sponsored 26th Annual State of the Art Echocardiography conference, in Scottsdale, AZ on February 11, 2013. Subvalvular and supravalvular aortic stenosis. Presented at the ASE-sponsored 26th Annual State of the Art Echocardiography conference, in Scottsdale, AZ on February 11, 2013. Walks like a duck, quacks like a duck, but is not a duck: what is not CAD? Presented at the ASE-sponsored 26th Annual State of the Art Echocardiography conference, in Scottsdale, AZ on February 10, 2013. I followed the ACC/AHA guidelines for use of echo in acute coronary syndrome and look what I got. Presented at the ASE-sponsored 26th Annual State of the Art Echocardiography conference, in Scottsdale, AZ on February 10, 2013. Limitations of contrast enhanced stress echo: boo! Presented at the ASE-sponsored 26th Annual State of the Art Echocardiography conference, in Scottsdale, AZ on February 10, 2013. 3D TEE appearance of mitral valve repairs and prostheses. Presented at 22nd Annual International Conference on Echocardiography: Case Studies & Recent Advances in Los Angeles, CA on November 3, 2012 during a session that I will co-chair with Drs. Nilda Espinola-Zavaleta and Mani A. Vannan. Interesting and instructive case studies. Presented at the 25th Annual Conference on Echocardiography in Callaway Gardens, GA on October 13, 2012. Congenital heart disease in adults. Presented at the 25th Annual Conference on Echocardiography in Callaway Gardens, GA on October 13, 2012. Use of 3D TEE to guide percutaneous interventions - TAVI. Presented at the 25th Annual Conference on Echocardiography in Callaway Gardens, GA on October 12, 2012 during a session that I will co-chair with Dr. Alexander Gedevanishvili. Update on echo evaluation of mitral and aortic stenosis. Low stroke volume, severe aortic stenosis. Use of BNP markers and statins. Presented at the 25th Annual Conference on Echocardiography in Callaway Gardens, GA on October 12, 2012 during a session that I co-chaired with Dr. Alexander Gedevanishvili. Echo Millionaire - Team presentation with Drs. Sorrell and Nanda. Presented at the 25th Annual Conference on Echocardiography in Callaway Gardens, GA on October 11, 2012. How to do a systematic 2D and 3D transesophageal echocardiographic examination in the a) Echo Laboratory/patient bedside, and b) Operating room. Prerequisites, How to get started. â€œStandardâ€� and â€œNon-Standardâ€� image planes. Identification of various anatomic structures. Indications and contraindications. Pitfalls and Artifacts. Presented at the 25th Annual Conference on Echocardiography in Callaway Gardens, GA on October 11, 2012. Mechanisms of Common Echo Artifacts. Presented at 12th Annual ECHO New York Course; New York, NY on October 6, 2012. Course director: Dr. Farooq Chaudhry. Basic Principles of Ultrasound and Doppler Physics. Presented at 12th Annual ECHO New York Course; New York, NY on October 6, 2012. Course director: Dr. Farooq Chaudhry. Strengths and weakness of pressure half-time in mitral stenosis. Presented at the 23rd scientific sessions of the American Society of Echocardiography in National Harbor, MD on July 3, 2012 during the Hemodynamics ticketed session that I co-chaired with Dr. Bijoy Khandheria. 3D echo imaging of pulmonary veins and other structures relevant to electrophysiologists. Presented at the American Society of Echocardiography-sponsored course Sights and Sounds of Echocardiography in the Heart of the Big Apple in New York City on May 26, 2012. Case studies: Pericardial effusion vs. pericardial fat. Presented at the American Society of Echocardiography-sponsored course Sights and Sounds of Echocardiography in the Heart of the Big Apple in New York City on May 26, 2012. Contrast-enhanced imaging in stress echo. Presented at the American Society of Echocardiography-sponsored course Sights and Sounds of Echocardiography in the Heart of the Big Apple in New York City on May 26, 2012. Rapid fire cases: Aortic dissection and aortic regurgitation. Presented at the American Society of Echocardiography-sponsored course Sights and Sounds of Echocardiography in the Heart of the Big Apple in New York City on May 25, 2012. LV diastolic function: Bench to bedside with illustrative cases. Presented at the American Society of Echocardiography-sponsored course Sights and Sounds of Echocardiography in the Heart of the Big Apple in New York City on May 24, 2012. Comprehensive Hemodynamic Evaluation by Doppler Echocardiography. Presented at the 2012 ASCeXAM/ReASCE Review Course sponsored by the American Society of Echocardiography, April 22, 2012 in Boston, MA. Aortic stenosis. Presented at the 2012 ASCeXAM/ReASCE Review Course sponsored by the American Society of Echocardiography, April 22, 2012 in Boston, MA. Echo assessment of the tricuspid valve. Presented at the American College of Cardiology i2 conference on March 26, 2012 in Chicago, IL. A defibrillator wire gone astray: Multimodality imaging. Presented at the 28th International Conference on Recent Advances in Echocardiography and Allied Techniques (MRI, CT Scan, Nuclear) in Chicago, IL on March 23, 2012 during a session that I co-chaired with Dr. Zvi Vered. Percutaneous closure of left atrial appendage. Presented at the 17th World Congress of Echocardiography on March 9, 2012 in SÃ£o Paolo, Brazil. 3D TEE imaging of pulmonary veins: Implications for atrial fibrillation ablation. Presented at the 17th World Congress of Echocardiography on March 8, 2012 in SÃ£o Paolo, Brazil. A pierced heart: Multimodality imaging of a cardiac complication after a vascular intervention. Presented at the 21st Annual International Conference on Echocardiography: Case Studies & Recent Advances in Orlando, FL on November 12, 2011 during a session that I co-chaired with Drs. Masood Ahmad and Leng Jiang. Case Studies in Contrast Echo. Presented at the 21st Annual International Conference on Echocardiography: Case Studies & Recent Advances in Orlando, FL on November 12, 2011; panel participants Drs. Masood Ahmad, H. Joachim Nesser, Muhamed Saric, Vincent L. Sorrell. How 3D/4D echo made a difference: Case studies. Presented at 11th Annual ECHO New York Course; New York, NY on October 23, 2011. Course director: Dr. Farooq Chaudhry. My most fascinating TEE case. Presented at 11th Annual ECHO New York Course; New York, NY on October 22, 2011. Course director: Dr. Farooq Chaudhry. Name that echo artifact. Presented at 11th Annual ECHO New York Course; New York, NY on October 22, 2011. Course director: Dr. Farooq Chaudhry. Common echo artifacts: Mechanisms and diagnosis. Presented at 11th Annual ECHO New York Course; New York, NY on October 22, 2011. Course director: Dr. Farooq Chaudhry. Review of ultrasound and Doppler physics. Presented at 11th Annual ECHO New York Course; New York, NY on October 22, 2011. Course director: Dr. Farooq Chaudhry. Mitral valve anatomy and pathoanatomy: Insights from 3-D TEE. 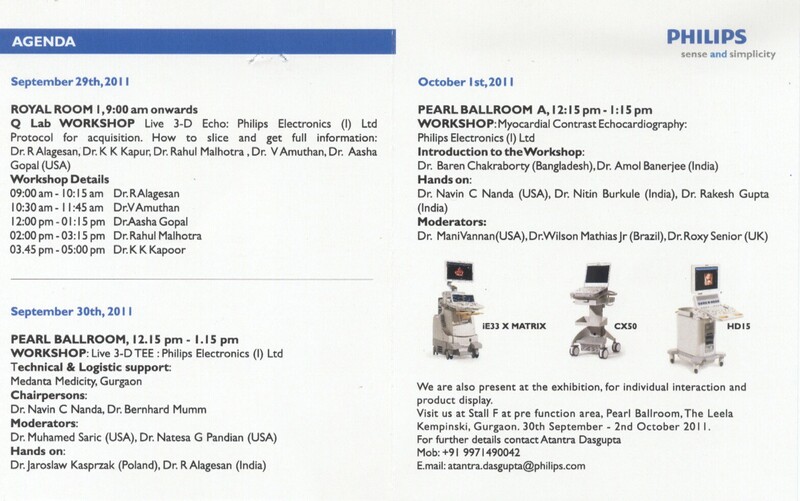 Presented at the 16th World Congress of Echocardiography in New Delhi, India on October 2, 2011. 3D TEE Workshop: Philips Electronics, Ltd. Participated as a panelist together with Drs. Navin Nanda, Bernhard Mumm, Natesa Pandian and Jaroslaw Kasprzak at the 16th World Congress of Echocardiography in New Delhi, India on September 30, 2011. Assessment of the LV morphology and function by 3D echocardiography. Presented during the session 3D: Couldn't see without it at the 22nd Annual Scientific Sessions of the American Society of Echocardiography in MontrÃ©al, Canada on June 12, 2011 during a session co-chaired by L. Gillam and M. Takeuchi. Echocardiography in pulmonary hypertension and pulmonary embolism. Presented at the American Society of Echocardiography-sponsored course Sights and Sounds of Echocardiography in the Heart of the Big Apple, May 21, 2011. Case studies in heart failure. Presented at the American Society of Echocardiography-sponsored course Sights and Sounds of Echocardiography in the Heart of the Big Apple, May 21, 2011. Stump the masters: Case presentation. Presented at the American Society of Echocardiography-sponsored course Sights and Sounds of Echocardiography in the Heart of the Big Apple, May 20, 2011. Echo Contrast: Where it is used; incremental value. Presented at the American Society of Echocardiography-sponsored course Sights and Sounds of Echocardiography in the Heart of the Big Apple, May 20, 2011. Severe asymptomatic aortic regurgitation but it is not the valve; other causes of aortic regurgitation. Presented at the American Society of Echocardiography-sponsored course Sights and Sounds of Echocardiography in the Heart of the Big Apple, May 19, 2011. Tricuspid and pulmonic regurgitation: Comprehensive 2D & Doppler evaluation. Presented at the American Society of Echocardiography-sponsored course Sights and Sounds of Echocardiography in the Heart of the Big Apple, May 19, 2011. Mitral valve prolapse, mitral regurgitation quantification: ASE guidelines in practice. Presented at the American Society of Echocardiography-sponsored course Sights and Sounds of Echocardiography in the Heart of the Big Apple, May 18, 2011. Two-dimensional and three-dimensional echocardiography in ASD/PFO closure. Presented at the 60th Annual Scientific Sessions of the American College of Cardiology (ACC) on April 5, 2011 in New Orleans, during a session that William Steward will co-chair with me. How do you hunt for Hunter's disease (echocardiographically speaking)? Presented at the 27th International Conference on Recent Advances in Echocardiography and Allied Techniques (MRI, CT Scan, Nuclear) in New Orleans, LA on April 2, 2011 during a session that Drs. Drs. Daniel Areco, Sunil Mankad, Ramdas Pai and Hanumanth K. Reddy will co-chair with me. Giant pericardial cyst: How the heart got its cushion. Presented at the 20th Annual International Conference on Echocardiography: Case Studies & Recent Advances in Chicago, IL on November 13, 2010 during a session that Drs. Julius M. Gardin, Brian D. Hoit, and Kiran B. Sagar co-chaired with me. Interesting 3D/4D echo studies. Presented at 10th Annual ECHO New York Course; New York, NY on October 10, 2010. Course director: Dr. Farooq Chaudhry. Cardiac hemodynamics by echocardiography. Presented at 10th Annual ECHO New York Course; New York, NY on October 9, 2010. Course director: Dr. Farooq Chaudhry. Key parameters for assessment of diastolic function. Presented at 10th Annual ECHO New York Course; New York, NY on October 9, 2010. Course director: Dr. Farooq Chaudhry. Echocardiography in non-lupus autoimmune and connective tissue disease. Presented at the 21st Annual Meeting of the American Society of Echocardiography in San Diego, CA on Sunday, June 13, 2010. Contrast Echocardiography: Where It Is Used? Incremental Value? Presented at the Sights & Sounds of Echocardiography in the Heart of the Big Apple, a course co-sponsored by Mayo Clinic and New York University, in New York City on May 29, 2010. Left ventricular systolic function. Presented at the Sights & Sounds of Echocardiography in the Heart of the Big Apple, a course co-sponsored by Mayo Clinic and New York University, in New York City on May 27, 2010. The TUPLE maneuver: 3D TEE imaging of atrial septal defects. Presented at the 26th International Conference on Recent Advances in Echocardiography and Allied Techniques (MRI, CT Scan, Nuclear) in Atlanta, GA on March 13, 2010 during a session that Drs. Drs. Reema Chugh, Kameswari Maganti and Sunil Mankad co-chaired with me. Aortic endograft surveillance. Invited speaker at the 14th World Congress of Echocardiography in Manilla, Philippenes, February 17-19, 2010. Talk presented via video link. The aging heart: Is impaired relaxation inevitable? Invited speaker at the 14th World Congress of Echocardiography in Manilla, Philippenes, February 17-19, 2010. Talk presented via video link. Flow in the left coronary artery: Forward in utero, backward in adulthood as seen on echocardiography and computed tomography. Presented at the 19th Annual International Conference on Echocardiography: Case Studies & Recent Advances in New Orleans during a session that Drs. Vadim A. Kuznetsov, and H. Joachim Nesser will co-chair with me on November 14, 2009 in Orlando, FL. Adult congenital heart disease. Presented at 9th Annual ECHO New York Course; New York, NY on October 12, 2009. Course director: Dr. Farooq Chaudhry. Hemodynamics by echocardiography. Presented at 9th Annual ECHO New York Course; New York, NY on October 10, 2009. Course director: Dr. Farooq Chaudhry. Evaluation of the right ventricle. Presented at 9th Annual ECHO New York Course; New York, NY on October 10, 2009. Course director: Dr. Farooq Chaudhry. Visualization of the descending thoracic aorta: How CT and MRI help us orient through the dizzying array of TEE images. Invited speaker at the 13th World Congress of Echocardiography in Kobe, Japan, July 18-20, 2009. Cancelled due to a scheduling conflict. Special topics: Basic principles of new technologies in cardiovascular ultrasound. Presided over this session at Sights & Sounds of Echocardiography in the Heart of the Big Apple, a course co-sponsored by Mayo Clinic and New York University, in New York City, May 23, 2009. Restrictive cardiomyopathy. Presented at Sights & Sounds of Echocardiography in the Heart of the Big Apple, a course co-sponsored by Mayo Clinic and New York University, in New York City, May 22, 2009. Hypertensive response in stress echo. 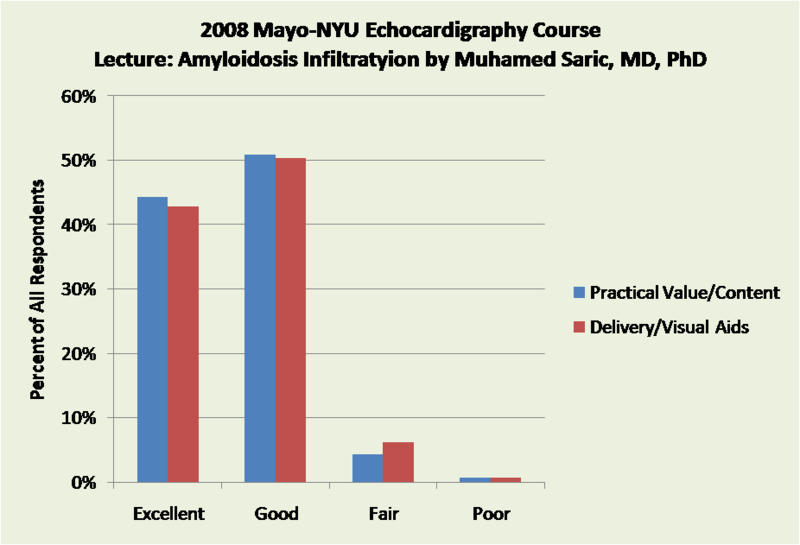 Presented at Sights & Sounds of Echocardiography in the Heart of the Big Apple, a course co-sponsored by Mayo Clinic and New York University, in New York City, May 22, 2009. Aortic stenosis: Case based approach to calculate mean gradient, valve area. Presented at Sights & Sounds of Echocardiography in the Heart of the Big Apple, a course co-sponsored by Mayo Clinic and New York University, in New York City, May 21, 2009. A special form of dextrocardia: Bilateral left-sidedness syndrome. Presented at the 25th International Conference on Recent Advances in Echocardiography and Allied Techniques (MRI, CT Scan, Nuclear) in Orlando, FL on March 28, 2009 during a session that Drs. Zee-Pin Ding, Juan Carlos Plana, Peter Rahko, Vibhuti Singh and Szilard Voros co-chaired with me. Pulmonary embolism: Multimodality imaging from start to finish. Presented at the 18th Annual International Conference on Echocardiography: Case Studies & Recent Advances in New Orleans on November 7, 2008 during a session that Drs. Aasha S. Gopal and Chittur A. Sivaram co-chaired with me. Congenital heart disease for the adult cardiologist. Presented at 8th Annual ECHO New York Course; New York, NY on October 13, 2008. Course director: Dr. Farooq Chaudhry. Comprehensive hemodynamics, PISA, vena contracta, effective regurgitant orifice area, pulmonary capillary wedge pressure: With case studies. Presented at 8th Annual ECHO New York Course; New York, NY on October 13, 2008. Course director: Dr. Farooq Chaudhry. Echocardiography in decompensated and advanced heart failure: Filling pressure in HF with reduced EF. Presented at the 19th Annual Meeting of the American Society of Echocardiography in Toronto, Canada on Sunday, June 8, 2008. Mitral stenosis: Anatomic valve area: 2-D, 3-D and TEE. Presented at the 19th Annual Meeting of the American Society of Echocardiography in Toronto, Canada on Monday, June 9, 2008. Bring your calculators - Diastolic Function. Presented at a special session co-chaired with Ronald J. Buono on May 23, 2008 in New York City at Sights & Sounds of Echocardiography in the Heart of the Big Apple, a course co-sponsored by Mayo Clinic and New York University. Illustrative cases of myocardial and pericardial disease: Amyloid infiltation. 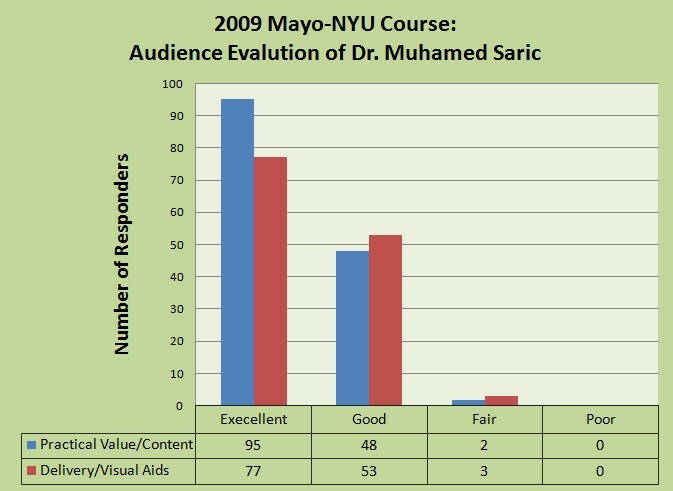 Presented on May 23, 2008 in New York City at Sights & Sounds of Echocardiography in the Heart of the Big Apple, a course co-sponsored by Mayo Clinic and New York University. Hemitruncus: Too old to be tied? Presented at the 24th Annual International Conference on Recent Advances in Echocardiography in Chicago, IL on March 29, 2008 during a session that Drs. Natesa Pandian, and Vibhuti Singh co-chaired with me. Esophageal rupture: The most feared TEE complication. Presented at the 12th World Congress of Echocardiography in Cartagena de Indias, Colombia on February 14, 2008. Air everywhere: May you never see it on your TEE. Presented at the 17th Annual International Conference on Echocardiography: Case Studies & Recent Advances in Orlando, FL on November 3, 2007 during a session that Drs. P.A.N. Chandraratna, Ramdas Pai, and Hanumanth Reddy co-chaired with me. Diastolic dysfunction: Key parameters. Presented at 7th Annual ECHO New York Course; New York, NY on October 6, 2007. Course director: Dr. Farooq Chaudhry. Comprehensive hemodynamics, PISA, vena contracta, EROA, PAWP: What needs to be reported. Presented at 7th Annual ECHO New York Course; New York, NY on October 6, 2007. Course director: Dr. Farooq Chaudhry. Aortic dissection: Comparing echocardiography to radiologic imaging. Presented as a special lecture at the 11th World Congress of Echocardiography in Rhodes, Greece on June 30, 2007. Cardiac situs: When the right isnâ€™t right. Presented at the 23rd Annual International Conference on Recent Advances in Echocardiography in New Orleans, LA on March 24, 2007 during a session that Drs. Hanumanth K. Reddy and Szilard Voros co-chaired with me. Thoracic aorta: Holes in the walls. Presented at the 16th Annual International Conference on Echocardiography: Case Studies & Recent Advances in Chicago, IL on November 11, 2006. Contrast echocardiography: differentiating thrombi from tumors. Presented at the 10th World Congress of Echocardiography in Rome, Italy on October 19, 2006. Diastolic dysfunction. Presented at 6th Annual ECHO New York Course; New York, NY on October 6, 2006. Course director: Dr. Farooq Chaudhry. Advanced hemodynamics: PISA, vena contracta, ERO for mitral regurgitation and beyond. Presented at 6th Annual ECHO New York Course; New York, NY on October 6, 2006. Course director: Dr. Farooq Chaudhry. Basic hemodynamics, SV, CO, regurgitant volume, PCWP. Presented at 6th Annual ECHO New York Course; New York, NY on October 6, 2006. Course director: Dr. Farooq Chaudhry. Complex mitral valve repair with 3D mitral valve imaging. Live intraoperative case with Drs. Alain Carpentier & Nirav Patel presented on April 25, 2006 during the symposium ACTS 2006: Advanced Cardiac Techniques in Surgery at Lenox Hill Hospital in New York City. From the belly to the heart: The other venous return. Presented at the 22nd Annual International Conference on Recent Advances in Echocardiography in Atlanta, GA on March 11, 2006 during a session that Drs. Kameswari Maganti and Ayan Patel co-chaired with me. Left ventricular mass: Now you see it, now you don't. Presented at the 15th Annual International Conference on Echocardiography: Case Studies & Recent Advances in Dallas, TX on November 12, 2005 during a session that Dr. Girish S. Shirali co-chaired with me. PISA method for MR & far beyond. Presented at the 5th Annual ECHO New York Course; New York, NY on October 9, 2005. Course director: Dr. Farooq Chaudhry. Constrictive vs. restrictive & pericardial diseases. Presented at the 5th Annual ECHO New York Course; New York, NY on October 8, 2005.Course director: Dr. Farooq Chaudhry. Diastolic dysfunction. Presented at the 5th Annual ECHO New York Course; New York, NY on October 8, 2005.Course director: Dr. Farooq Chaudhry. Diastolic heart failure: Does it really exist? Presented at the 9th World Congress of Echocardiography in Marrakesh, Morocco on September 15th, 2005. The tumor and the heart: A long-distance relationship. 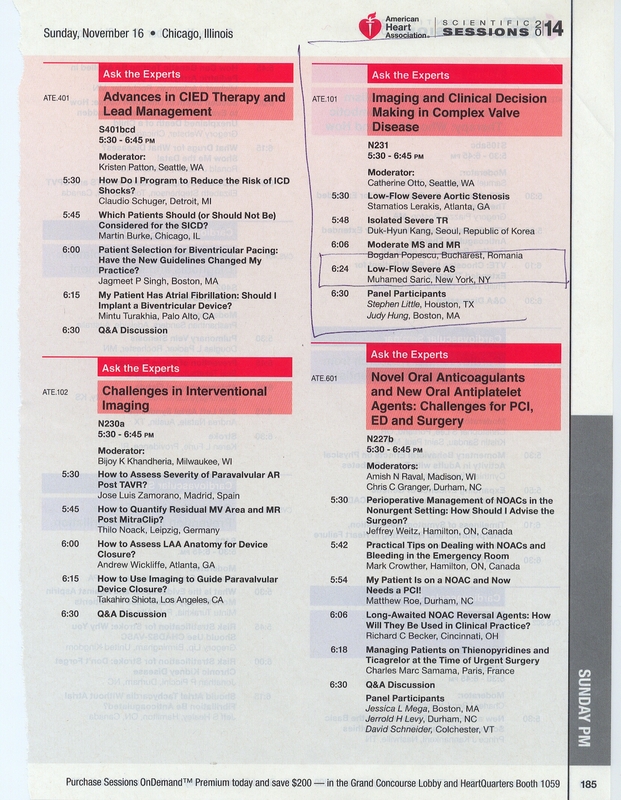 Presented at the 21st Annual International Conference on Recent Advances in Echocardiography, Orlando, FL on March 5, 2005 during a session that Drs. Mohsin Alam & Kiran Sagar co-chaired with me. Rheumatic or rheumatologic aortic valve disease? Presented at the 14th Annual International Conference on Echocardiography: Case Studies & Recent Advances, New Orleans, LA on November 6, 2004. PISA method for MR & far beyond. Presented at the 4th Annual ECHO New York Course; New York, NY on October 9, 2004. Course director: Dr. Farooq Chaudhry. Diastolic dysfunction. Presented at the 4th Annual ECHO New York Course; New York, NY on October 10, 2004.Course director: Dr. Farooq Chaudhry. Illustrative cases of echocardiography in heart failure: Not the usual suspects. We present, you diagnose: Myocarditis. 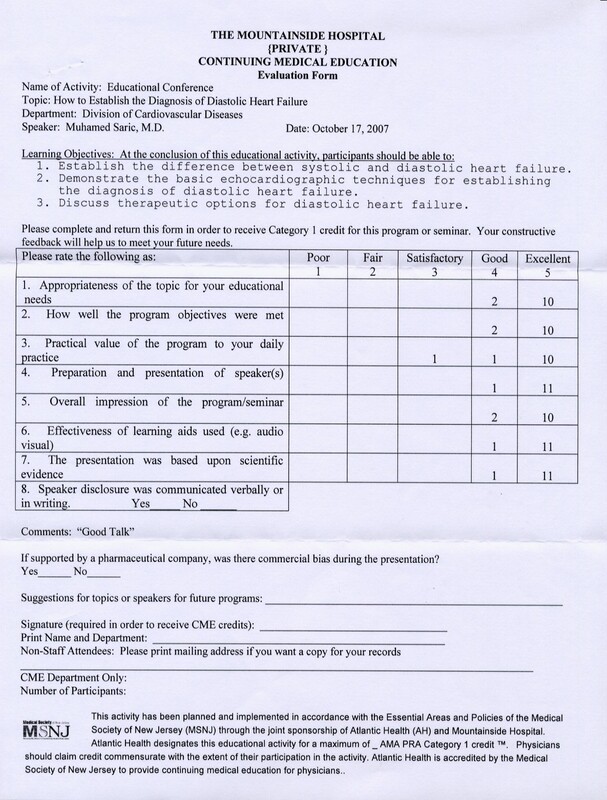 Presented at the 15th Annual Scientific Sessions of the American Society of Echocardiography in San Diego, CA on June 27, 2004. Stroke: The cause may be in the heart, not in the head. Presented at the 8th World Congress of Echocardiography in Antalya, Turkey on May 9th, 2004. PISA method: Use in mitral regurgitation & far beyond. Presented at the 8th World Congress of Echocardiography in Antalya, Turkey on May 8th, 2004. Signet-ring adenocarcinoma that sealed the patient's heart (and his fate). Presented at the 20th Annual International Conference on Recent Advances in Echocardiography, New Orleans, LA on March 6, 2004. This talk was voted as the Best Presentation of the Session by the audience. Visiting a gynecologist can stun oneâ€™s heart. Presented at the 13th Annual International Conference on Echocardiography: Case Studies & Recent Advances, Orlando, FL on November 8, 2003. Infectious endocarditis: Transthoracic vs. transesophageal echocardiography. Presented at the 7th World Congress of Echocardiography & Vascular Ultrasound, Buenos Aires, Argentina on October 11, 2003. Diastolic heart failure: Myth or reality? Presented at the 7th World Congress of Echocardiography & Vascular Ultrasound, Buenos Aires, Argentina on October 11, 2003. PISA method: How to. Presented at the 3rd Annual ECHO New York Course; New York, NY on September 15, 2003. Course director: Dr. Farooq Chaudhry. Diastolic dysfunction. 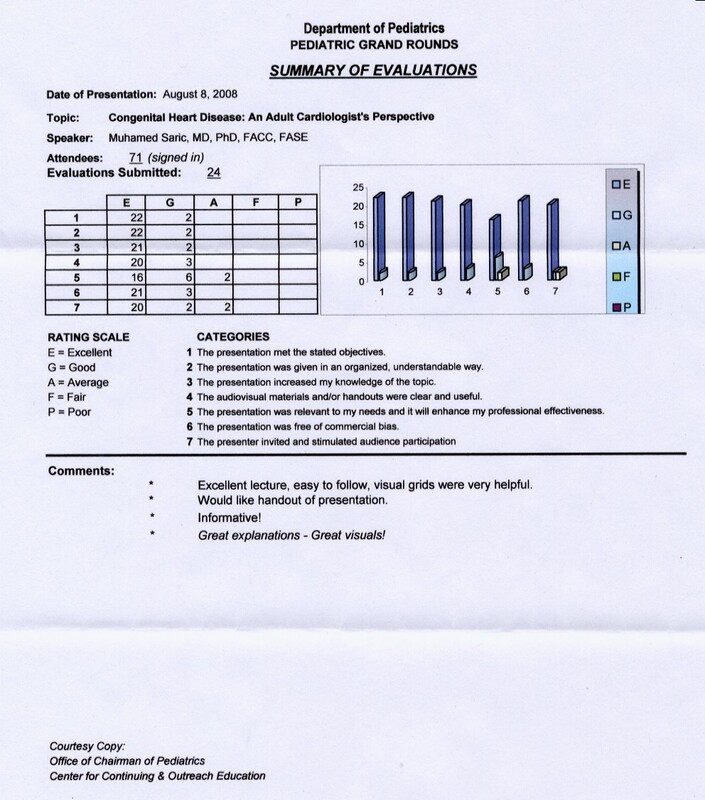 Presented at the 3rd Annual ECHO New York Course; New York, NY on September 13, 2003. Course director: Dr. Farooq Chaudhry. Echocardiographer turned gastroenterologist: Congestive heart failure due to extrinsic compression of left atrium. Presented at the 19th Annual International Conference on Recent Advances in Echocardiography, Chicago, IL on March 29, 2003. Contrast echocardiography: Bubbles, bubbles where do you go? Presented at the 12th Annual International Conference on Echocardiography: Case Studies & Recent Advances, Chicago, IL on November 16, 2002. Diastolic dysfunction. Presented at the 2nd Annual ECHO New York Course; New York, NY on October 5, 2002. Course director: Dr. Farooq Chaudhry. Transgastric echocardiography â€“ A novel imaging tool for visualization of TIPS (transjugular intrahepatic porto-systemic) shunts in patient with advanced liver disease. Presented at the 18th Annual International Conference on Recent Advances in Echocardiography, Atlanta, GA, March 16, 2002. Percutaneous ASD and PFO closure. Presented at the NYU Invasive Cardiology Update for Practicing Health Care Professionals course in New York City on April 14, 2018. Clinical importance of cardiac chamber volume measurements. Presented at the Philips conference on novel 3D echocardiography techniques in St. Louis, MO on May 4, 2017. Stump the expert: Interesting & challenging case studies. Presented at the 16th Annual Cardiology Meeting, a New York Chapter of the American College of Cardiology sponsored course, at Rocking Horse Ranch, NY on April 22, 2017. Multimodality imaging: The cornerstone of percutaneous structural heart disease repair. Grand rounds talk given at Mount Sinai â€“ St. Lukeâ€™s campus on January 18, 2017. Echo evaluation of pericardial disease and constriction. Presented at the 9th Annual Echocardiography Update course in Philadelphia, PA on January 15, 2017. Clinical importance of volume measurements. Presented at the Philips conference on novel 3D echocardiography techniques in Boston, MA on May 3, 2016. Stump the expert: Interesting & challenging case studies. Presented at the 15th Annual Cardiology Meeting, a New York Chapter of the American College of Cardiology sponsored course, at Rocking Horse Ranch, NY on April 9, 2016. Clinical importance of volume measurements. Presented at the Philips conference on novel 3D echocardiography techniques in Pittsburgh, PA on March 29, 2016. Adult Congenital Heart Disease. Presented at 2nd Annual Invasive Cardiology Update for Practicing Physicians at New York University Medical School on April 9, 2016. Clinical importance of volume measurements. Presented at the Philips conference on novel 3D echocardiography techniques in New York City on December 15, 2015. Stump the expert: Interesting & challenging case studies. Presented at the 14th Annual Cardiology Meeting at Mohonk, NY on April 25, 2015. Mitral regurgitation: When to send to surgery. Presented at the 1st Invasive Cardiology Updated for Practicing Physician course at New York University Medical School on April 11, 2015. Percutaneous mitral valve clipping: The indispensable role of 3D TEE in procedure guidance. Presented at the American College of Cardiology Oklahoma Chapter conference in Oklahoma City, OK on April 26, 2014. Congenital heart disease in adults: Role of multimodality imaging in diagnosis & management. Presented at Hackensack University Medical Center, Hackensack, NJ on August 5, 2013. Strain and strain rate: How clinically useful is it. Presented at Hackensack University Medical Center, Hackensack, NJ on November 20, 2012. Multimodality imaging of the tricuspid valve: Something old, something new. Presented at the meeting of the Delaware Valley Echo Society in Philadelphia, PA on June 21, 2012. Quantification of aortic insufficiency. Presented at the Echo 2009 & Beyond conference at the Peninsula Regional Medical Center, Salisbury, MD on Saturday on April 4, 2009. Case discussion: Endocarditis. Panel discussion hosted together with Dr. Justin Sambol, cardiac surgeon, and Dr. Lisa Dever, infectious disease specialist, at the UMDNJ-sponsored course Advances in Cardiovascular Disease Management in Short Hills, NJ on October 7, 2006. Imaging pearls in cardiovascular disease and advances in stress testing. Presented at the UMDNJ-sponsored course Cardiovascular Disease Management for the Primary Care Physician in Short Hills, NJ on October 8, 2005. Non-invasive evaluation of heart failure. Presented at the 2nd Annual New Jersey Cardiovascular Symposium, Newark, NJ on June 5, 2004. Non-invasive testing in the evaluation of chest pain. Presented at the 1st Annual New Jersey Cardiovascular Symposium, Newark, NJ on May 2, 2003. 2D, 3D and stress echo to guide treatment in hypertrophic cardiomyopathy. To be presented at the NYU Langone Health-sponsored conference Hypertrophic Cardiomyopathy: Comprehensive Management of a Complex Disease in New York City on April 27, 2019. How to build a successful TAVR program: Imaging perspective. Presented in Media, PA on April 15, 2019. Multimodality imaging of percutaneous & surgical left atrial appendage occlusion / exclusion. Cardiology grand rounds given at Johns Hopkins Medical Center on March 13, 2019 in Baltimore, MD. TAVR: Echo measurements pre, during & after procedure. Given in Buffalo, NY on March 11, 2019. Role of multimodality imaging in percutaneous closure of left atrial appendage. Cardiology grand rounds given at California Pacific Medical Center on February 20, 2019 in San Francisco, CA. TAVR: Echo measurements pre, intra and post procedure. Given to Wesley Medical Center staff in Wichita, Kansas on November 20, 2018. Multimodality imaging guidance of percutaneous and surgical occlusion of the left atrial appendage. Cardiology grand rounds given at Methodist DeBakey Heart & Vascular Center in Houston, TX on November 1, 2018. Bioprosthetic mitral valve failure: Valve-in-valve transcatheter MVR vs. redo surgical MVR. Panelist at the meeting of the American Heart Association Greater New York Cardiology Fellows Society meeting in New York City on June 5, 2018. Percutaneous mitral valve repair and replacement options. Cardiology grand rounds given at NYU Winthrop Hospital, Mineola, NY on May 22, 2018. Echo evaluation of cardiac source of embolus. Talk presented at the meeting of the Delaware Echo Society in Philadelphia, PA on April 26, 2018. Advances in echocardiography: Mitral valve disease. Cardiology grand rounds given at Temple University, Philadelphia, PA on April 3, 2018. Multimodality imaging: The cornerstone of percutaneous structural heart disease repair. Cardiology grand rounds given at Mount Sinai St. Luke's Hospital, New York, NY on January 18, 2017. Percutaneous repair of structural heart disease: Indispensable role of multimodality imaging. Cardiology grand rounds given at Stamford Hospital, Connecticut on December 2, 2016. Echocardiography of adult congenital heart disease: An in-depth review. 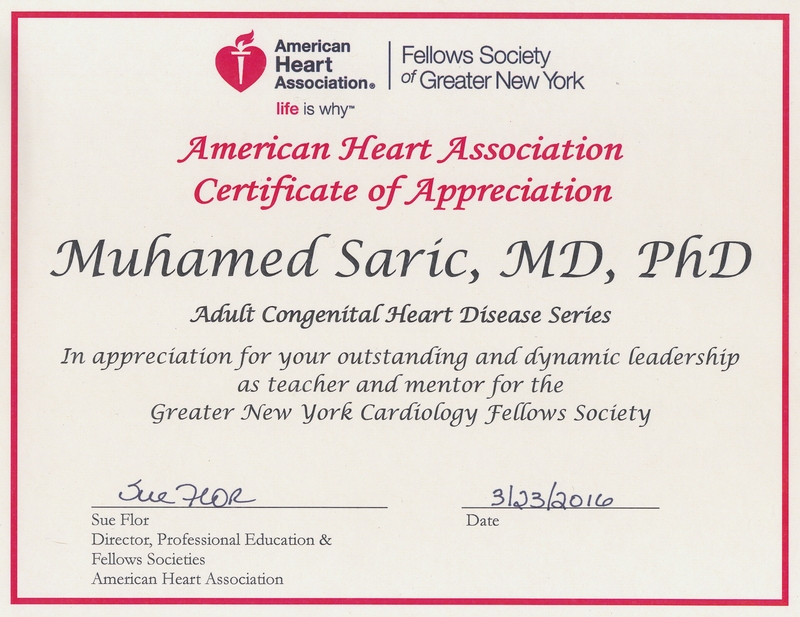 Given at the AHA Cardiology Fellows Society of Greater New York in New York City on March 23, 2016. 3D TEE guidance of percutaneous atrial fibrillation interventions. Cardiology grand rounds given at Morristown Medical Center, Morristown, NJ on February 26, 2016. Transcatheter aortic valve replacement: What the new generation of prostheses promises to deliver. Cardiology grand rounds given at California Pacific Medical Center, San Francisco, CA on March 25, 2015. 3D echocardiography: Its indispensable role in diagnosis and percutaneous repair of structural heart disease. Cardiology grand rounds given at New York University Langone Medical Center on June 6, 2014. Percutaneous closure of left atrial appendage to prevent thromboembolism in patients with atrial fibrillation: The crucial role of 2D and 3D echocardiographic imaging in procedure guidance. Cardiology grand rounds given at Montefiore Medical Center, Yeshiva University, New York City on April 1, 2014. Mitral valve anatomy, repair and prosthetic replacement: Indispensable role of 3D echocardiography. Cardiology grand rounds given at California Pacific Medical Center, San Francisco, CA on March 5, 2014. Prosthetic heart valves: From their invention to modern imaging. Cardiology grand rounds given at Beth Israel Medical Center, New York, NY on October 7, 2013. Novel insights into valvular heart disease. Cardiology grand rounds given at Winthrop University Hospital, Mineola, NY on October 1, 2013. 3D TEE guidance of percutaneous procedures for repair of structural heart disease. Cardiology grand rounds given at California Pacific Medical Center, San Francisco, CA on February 6, 2013. 3D echocardiography: A passing fad or true revolution in imaging of the heart. Cardiology grand rounds given at Beth Israel Medical Center, New York, NY on October 1, 2012. Guidance of percutaneous repairs of structural heart disease: The expanding role of 3D echocardiography. Cardiology grand rounds given at University of Alabama at Birmingham on September 12, 2012. Mitral valve disease: Novel insights from 3D echocardiography. Cardiology grand rounds given at St. Luke's Hospital, New York City on March 30, 2011. The brave new world of real-time 3D echocardiography. Presented at the New York Methodist Hospital, Brooklyn, NY on February 10, 2011. Restriction vs. Constriction. Presented at St. Lukeâ€™s-Roosevelt Hospital Center, New York, NY on September 21, 2010. Valvular heart disease I & II. Presented at the Cardiology Board Review Course organized by the AHA Fellows Society of Greater New York on May 22, 2010. Comprehensive hemodynamics by echocardiography. Given at St. Lukeâ€™s-Roosevelt Hospital Center, New York, NY on August 12, 2009. Valvular heart disease I & II. Presented at the Cardiology Board Review Course organized by the AHA Fellows Society of Greater New York on May 30, 2009. Congenital heart disease: Challenges for adult cardiologist. Given at Mountainside Hospital, Montclair, NJ on April 8, 2009. Congenital heart disease: Impact on pregnancy, labor and delivery. Grand rounds given to the Department of Gynecology and Obstetrics at UMDNJ in Newark, NJ on February 4, 2009. Congenital heart disease: An adult cardiologistâ€™s perspective. Grand rounds given to the Department of Pediatrics at UMDNJ in Newark, NJ on August 8, 2008. Ultrasound imaging of aortic disease: How does it compare to other imaging modalities. Grand rounds given to the Department of Vascular Surgery at UMDNJ in Newark, NJ on May 13, 2008. Valvular heart disease I & II. 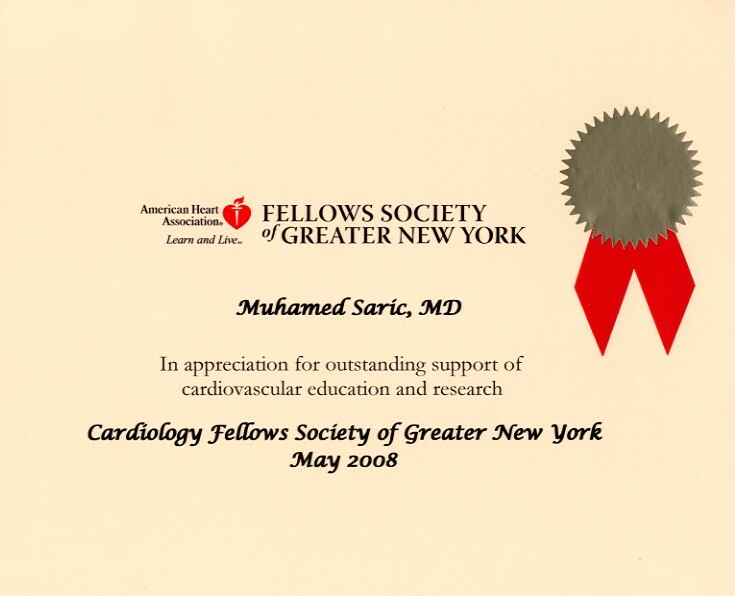 Presented at the Cardiology Board Review Course organized by the AHA Fellows Society of Greater New York on May 10, 2008. Diastolic function and dysfunction. Given at St. Lukeâ€™s-Roosevelt Hospital Center, New York, NY on April 10, 2008. Ventricular mechanics during diastole: New echocardiographic insights. Given at Hackensack University Medical Center, NJ on November 13, 2007. How to establish the diagnosis of diastolic heart failure. Given at Mountainside Hospital, Montclair, NJ on October 17, 2007. Hemodynamic Evaluation by Echocardiography. Given at St. Lukeâ€™s-Roosevelt Hospital Center, New York, NY on September 20, 2007. Dextrocardia: Is it right, or is it wrong? Given as a Pediatrics Department grand rounds at UMNDJ, Newark, NJ on July 20, 2007. Aortic dissection: From diagnosis to treatment. Given at St. Lukeâ€™s-Roosevelt Hospital Center, New York, NY on June 21, 2007. When a cardiologist meets a radiologist: Multimodality imaging of adult congenital heart disease. Given as a cardiology grand round at UMDNJ, Newark, NJ on April 25, 2007. Nonsystolic heart failure: Should we blame it on the left ventricular diastolic dysfunction? Given at the meeting of the Erie County Echo Society, Buffalo, NY on March 27, 2007. Left ventricular dysfunction and strain. Given at the meeting of the New York Echo Society in New York City on March 21, 2007. Valvular heart disease. Given at St. Lukeâ€™s-Roosevelt Hospital Center, New York, NY on January 18, 2007. Diastolic Dysfunction. Given at St. Lukeâ€™s-Roosevelt Hospital Center, New York, NY on January 12, 2006. Echocardiographic contrast: Standard & innovative uses. Given at Jersey Shore Medical Center, Neptune, NJ on December 9, 2003. Clinical utility of the new-generation echocardiographic contrast agents. Given at Horton Memorial Hospital, Middletown, NY on June 6, 2003. Echocardiographic contrast: The time has come. Given at Englewood Hospital, Englewood, NJ on June 4, 2003. Diastolic heart failure: Myth or reality? Given at Veterans Affairs New Jersey Health Care System, East Orange, NJ on December 4, 2002. Stroke â€“ A cardiologist perspective. Given at St. Lukeâ€™s-Roosevelt Hospital Center, New York, NY on October 4, 2001. The role of pulmonary vein flow analysis in the assessment of left ventricular function. Given at UMDNJ â€“ New Jersey Medical School, Newark, NJ on February 9, 2000. Pulmonary vein flow analysis: A novel window into cardiac physiology. Given at New York University Medical School, New York, NY on April 8, 1999. Mitral valve disease: New diagnostic and therapeutic insights from 3D echocardiography. Given at St. Luke's - Roosevelt Hospital Center on May 5, 2011. Aortic dissection - It rips, it cleaves, it kills. Alternative titles - Aortic Dissection: An Undesirable Cleavage; Aortic Dissection: Not a Jack But a Ripper Nonetheless. 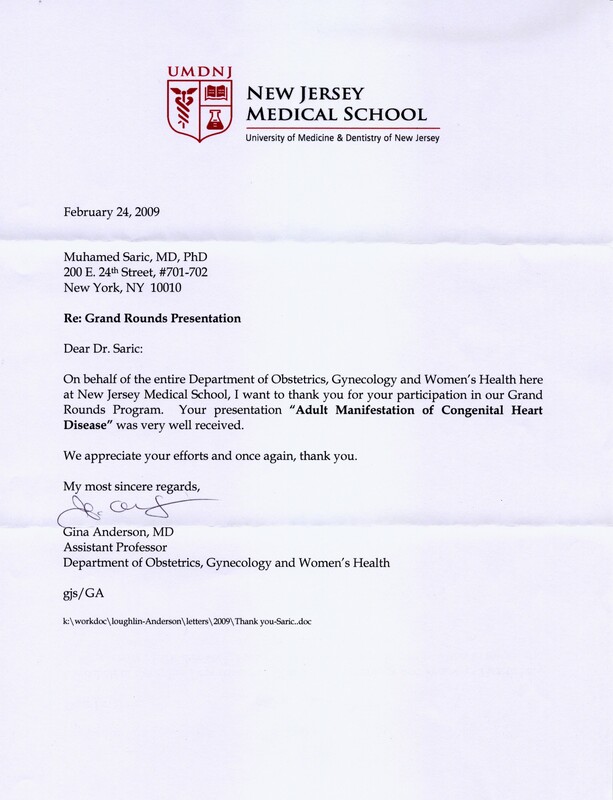 Given at UMDNJ â€“ New Jersey Medical School, Newark, NJ on May 27, 2008. Diastolic heart failure: Definition, echocardiographic findings, treatment and prognosis. Given at Mountainside Hospital, Montclair, NJ on May 17, 2007. Diastolic heart failure: Does it really exist? Given at UMDNJ â€“ New Jersey Medical School, Newark, NJ on April 19, 2005. Stroke: The cause may be in the heart, not in the head. Given at UMDNJ â€“ New Jersey Medical School, Newark, NJ on March 16, 2001. Introduction to clinical medicine. Given as a science seminar to high-school students at NYU School of Medicine in New York City on June 25, 2012. Heart as you have never seen it. Given as a science seminar to middle-school and high-school students at NEST+M (New Explorations Into Science, Technology and Math) School in New York City on May 11, 2007.